First reaction: Hachiko… oh hey, it’s a story about that Akita that waited for his dead master every day for years. AWESOME! Second reaction: OMG SHIBA SQUEEE! Third reaction: Wait a minute… that Shiba is supposed to be an Akita puppy? MOVIE RUINED. Fourth reaction: Oh, god, now Shibas are going to be in the North American public eye! PANIC. Fifth reaction: ALL FILMMAKERS MUST DIE. ETA: Here’s a clip from the 1987 movie Hachiko monogatori – starring a real Akita puppy playing Hachiko as a young dog, even! Thanks to Gail who sent me this! 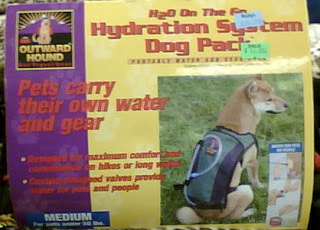 Here we have a Shiba who is no doubt delighted to have this water/supply backpack on. 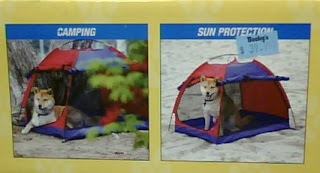 Next, we have something more in keeping with a Shiba’s goals: a nice tent for camping! This nylon tent sports bug mesh to keep your Shiba free from mosquitoes. I think I remember some Ziggys that had a Shiba puppy on them, but we don’t have that packaging any more. 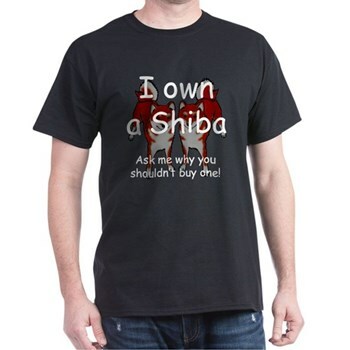 Akira and Shiro’s blog has a post about Shibas in other kinds of advertising. Last but not least, I have to promote my favourite screensaver: Kissing Canines, which features Libby the Shiba, both as herself and wearing a santa hat.